Digital Rain is a one person project by Russian artist and producer Alexey Romanov. 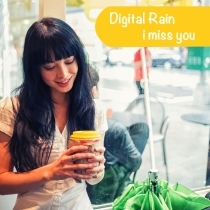 He comes up with a beautiful bouquet of music flowers – the EP “I Miss You”. 6 relaxed and emotional Chillout tracks which are tastefully arranged and carry a message coming from the heart. Enjoy these wonderful tunes and feel attracted and inspired by this angelic music. A beautiful bouquet of music flowers – 6 relaxed and emotional Chillout tracks which are tastefully arranged and carry a message coming from the heart.